At the end of 2017, SpinVFX was honoured to lead a series of workshops on the visual effects process for members of the Directors Guild of Canada (DGC). Attendees were treated to six workshop sessions that covered the many steps it takes to deliver a final shot. Led by numerous SpinVFX experts, the workshops covered topics such as the technical elements of on-set visual effects requirements, VFX budgeting and tax credits, the VFX pipeline, and the turnover process, among many others. Workshop instructors included SpinVFX President/Executive Producer, Neishaw Ali, Executive Producer George Macri, CG Producer Chris Cox and VFX Producer Amanda Lariviere, who provided invaluable insight in to the bidding, tax credits and production management that drives each show, ensuring transparency with clients to problem-solve challenging situations through to delivery of high quality work. 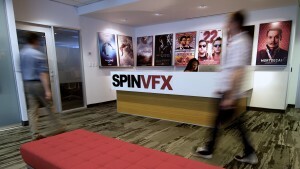 The series also included several SpinVFX artists who explained our pipeline and various departments that contribute to each production, including Lead Compositor Andrew Scott, Animation Director Peter Giliberti, and VFX Supervisors Wes Sewell, Tim Sibley, Cesar Dacol Jr. and Andrew McPhillips. Additionally, I/O Supervisor Brandon Terry led a dynamic workshop that brought all of these elements together in a discussion about colour grading and turnover. The sessions attracted a wide range of DGC members, from directors and producers, to location managers and post-production supervisors. SpinVFX was thrilled to have the opportunity to educate and answer questions about this integral part of the filmmaking process. “It’s our job to help demystify the visual effects process as we work together to help achieve the Director’s vision” says Neishaw Ali. SpinVFX believes that by facilitating an open dialogue, the film industry can achieve a higher standard of quality, and offer greater artistic agility – both for on-set and post-production teams. We thank the DGC for coordinating each workshop, and for partnering with SpinVFX on this series.